Chopped up and rolled into (little) balls or patties, meat, fish and vegetables appear in many guises the world over. These delicious morsels offer a never-ending variety of food possibilities! Many countries have a fine tradition of mixing and binding an array of ingredients to create simple but delicious dishes, whether chopped up finely as tartare, fashioned into burgers or rolled into meatballs, boulettes or dumplings. Borrowing from such global culinary heritage and inspired by the popularity of street food and New York-style delicatessens, the team behind Café Moderne in Paris reinvents in Tout Haché the modest meatball in a surprising number of variations. Discover mouth-watering combinations of flavours in the simplest of recipes: spicy chicken meatballs, lamb koftas, meatballs with ricotta, salmon fishballs, Lebanese lamb tartare, prawn and mango tartare, tandoori burgers, chorizo burgers, stuffed tomatoes, mango and coconut milk, chocolate coconut truffles and many more delicious dishes. 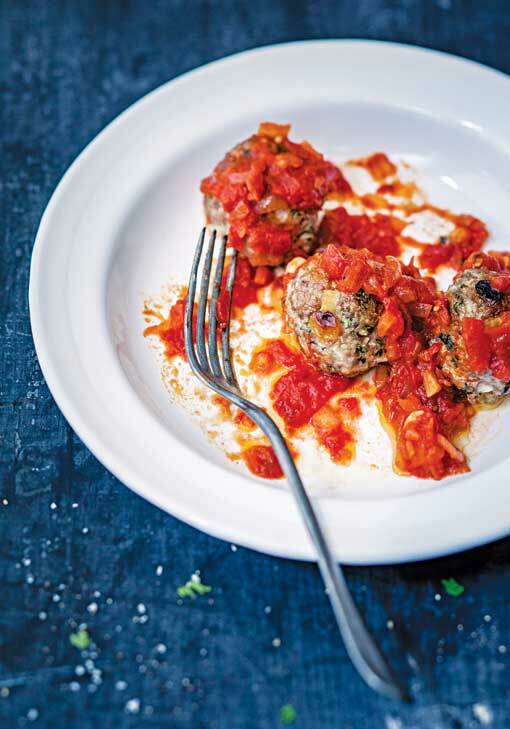 Proving that theres more to meatballs than tomato sauce, this stylish collection of over 30 recipes also features a variety of sauces and accompaniments, including creamed polenta, classic frites and mixed fried vegetables. Inspired by street food and New York delis, the Café Moderne team have reinvented the ubiquitous meatball and created recipes inspired by flavours from all around the world. CAFÉ MODERNE is a chic restaurant in Bastille, Paris, run by three friends, one a trained chef and two with a passion for the street food of New York. The menu they have created, offering a tempting variety of meatballs and burgers served with mix-and-match sauces, is a celebration of the culinary love affair that exists between Paris and New York. Tout haché means all chopped and this is what the book is all about. It covers meatballs, tartares and burgers together with some suggested sauces and side dishes. So most of the recipes are to do with meat that has been minced . . . or fish t5hat has been chopped. I love burgers so to find a book featuring them caught my eye although the book is a lot more than just burger recipes. Meatballs are the main recipes in the book. I have always thought of meatballs as simple things but with 12 different recipes in the book I have found a whole new desire to make meatballs. 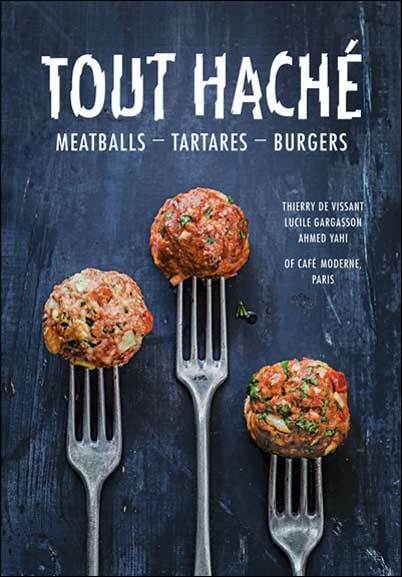 The introduction to the book will give you a brief insight into where the book is coming from but basically you have French cuisine taking on board the American meatball and burger and giving it a twist, making it something a little bit special. Just reading the recipes you can almost taste them. I'm not quite sure why the section on truffles is there as it seems completely out of place, however don't knock it because the recipe looks delicious. Whilst not a thick book it is quite large as its pages are roughly A4 size. It means there is plenty of white space on pages with text, making it easy to read. The benefit of the format is some wonderful, and very appetising, photography. You could almost want the book just for the photographs. All the recipes are easy to follow, do not require hard to find ingredients and are easy enough for everyone to have a go at making. The section on tartares is well worth looking at as there are not many recipe books which include these recipes. Most people on hearing tartares are made with raw meat or raw fish immediately react Yuk. Don't jump to conclusions! With the fish tartares the chemical reaction of the citric acid has the same effect as cooking. If you never tried steak tartare you haven't lived. The number of recipes in the book is not huge but you will find a great many recipes that you will like to try, unlike many cookbooks where you only find possibly one or two recipes that catch your eye. Make the cream sauce by mixing together all the ingredients. This can be gently heated if required. Peel and chop the onion. Heat the olive oil in a non-stick frying pan (skillet), then add the onion. Cook over high heat, making sure that the onion does not stick. When the onion is transparent, deglaze the pan with the port. Reduce the heat, add the sugar and simmer for 15 minutes. Preheat the oven to 150°C/300°F/Gas 2. Cut the buns in half and put the halves in the preheated oven. Cut open the chorizo, scoop out the meat filling and mix it with the minced (ground) beef. Make into 4 patties. Heat a non-stick frying pan (skillet), then add the patties and cook for 3 minutes. 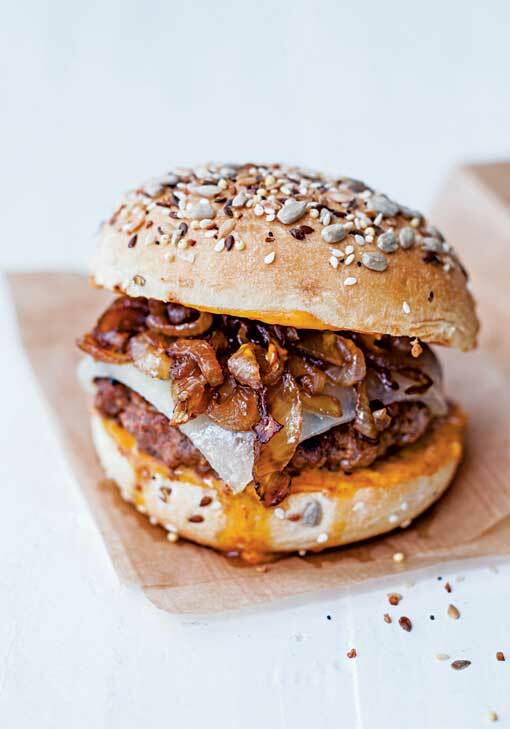 Turn the patties over and top each one with 1 tbsp of the caramelized onion and 1 slice of manchego cheese. Cook for 2  3 minutes more, according to taste. Remove the buns from the oven. Spread each half with 1 tbsp of cream sauce, and put the patties with their onion and Manchego cheese on the bottom halves. Cover the burgers with the top halves of the buns. Grease a baking sheet with the olive oil and set aside. Chop the herbs. Mix together with all the remaining ingredients in a large bowl. Form the mixture into balls of about 4 cm (1½in) diameter and arrange on the baking sheet. Cook in the preheated oven for 18  20 minutes, until the meatballs are cooked through. 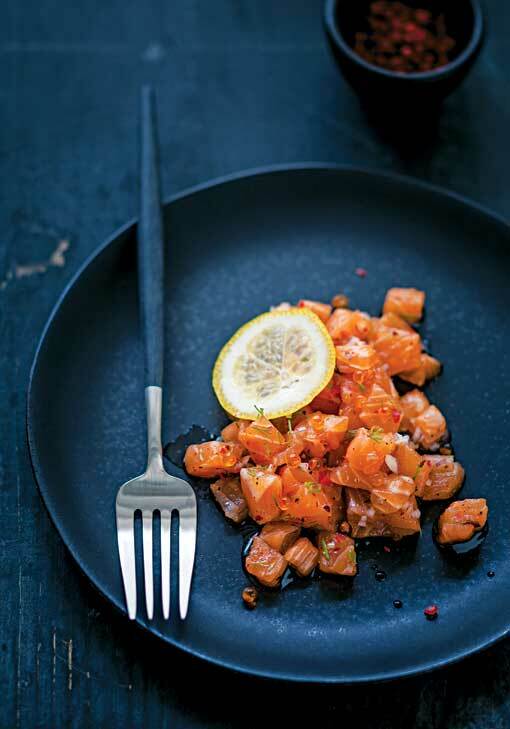 Cut the salmon fillet and smoked salmon into small dice with a knife. Add the shallots, lemon juice, olive oil, chopped dill, pink peppercorns and coriander seeds. Add salt and pepper to taste. Use a cooking ring or large glass to shape the tartare mixture on the serving plates. Garnish with salmon roe and serve very cold.